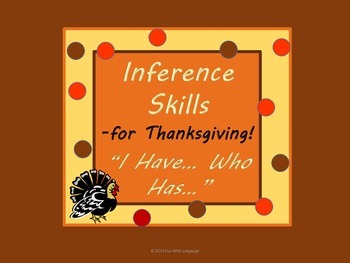 Practice or introduce inference skills while playing “I have… Who has...?” with a Thanksgiving twist! 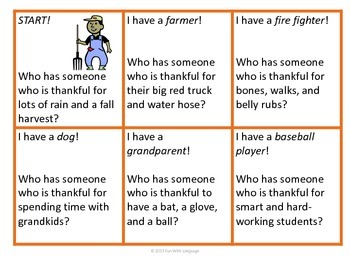 Each turn begins with “Who has someone who is thankful for…” and the students have to figure out who would be thankful for those things. This is a fun game for the whole class to play together, but can be played with smaller groups as well. 6. Two examples of hand print and foot print turkey art for inspiration! You can download the coloring pages in the preview if you would like! Aligned with CCSS Reading Anchor Standard #1 for K-5. 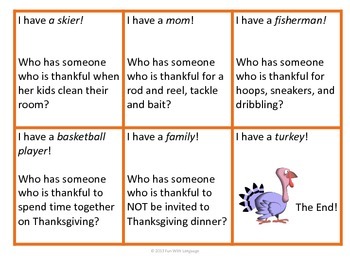 You might also want to check out my Holiday Activities for grammar games, writing activities, and book studies with a holiday theme. New products are 50% off for the first 48 hours they’re listed! Click “follow me” and receive an email each time a new product is added to my store!